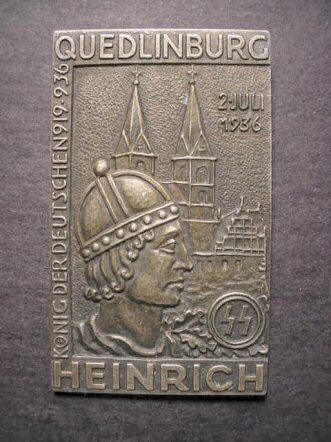 DESCRIPTION: This is a solid-silver edition of the commemorative plaque, salver, or nonportable award given out to SS personnel who accompanied Reichsfuhrer Heinrich on his famous visit to the Quedlinburg Cathedral where rest the remains of Heinrich I, "The Fowler," reign 919-936. 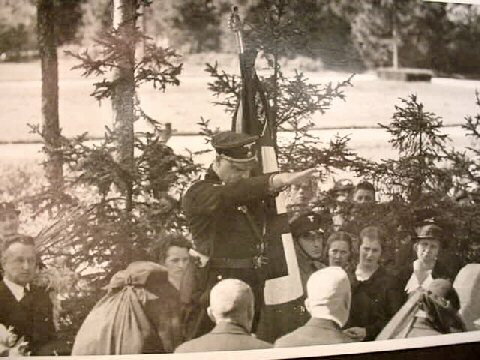 Himmler, it has been said, believed himself to be a reincarnation of this, the greatest of the Saxon kings, who turned back the marauding hordes of Magyars from the east. 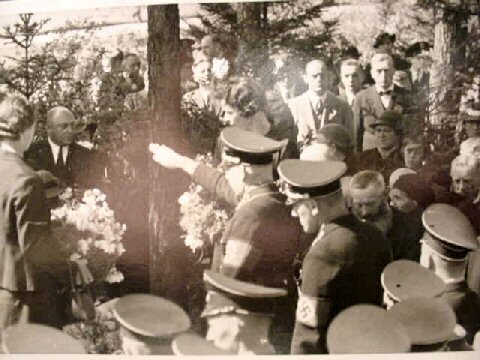 On the 2nd of July 1936, Himmler, with a large contingent of SS leaders and persons of political importance converged on the old cathedral to lay an elaborate wreath at the gravesite. 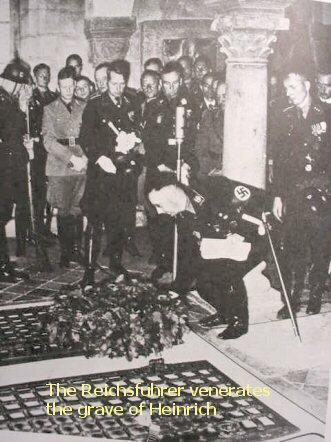 This, accompanied with a speech by the Reichsfuhrer praising Heinrich I as the savior of western Europe and the western culture-bearing stratum (Germanic peoples, who otherwise might have suffered worse than Rome did under the heel of the Barbarian hordes). 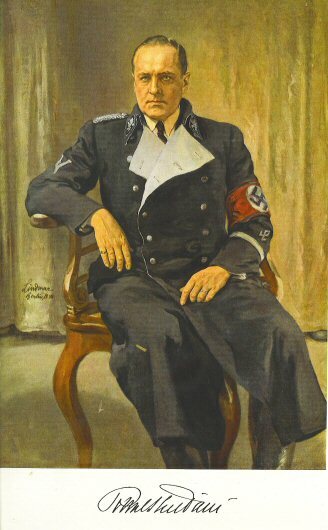 He likened this with the mission of the SS which purportedly would now save "holy Europe from the barbarism of Bolshevism." The planchet is of genuine silver and the detail fantastic. 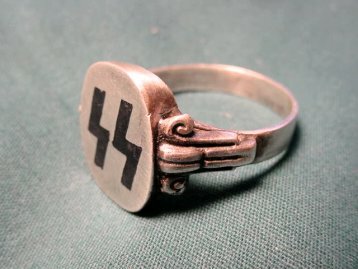 Several of these were found in a bombed-out jeweler's workshop in Berlin. They were made in pin form in copper and bronze as well, but this is the presentation grade given only to those officials who had attended and contributed to this auspicious occasion. Measures about 2 1/2 x 1 1/2. 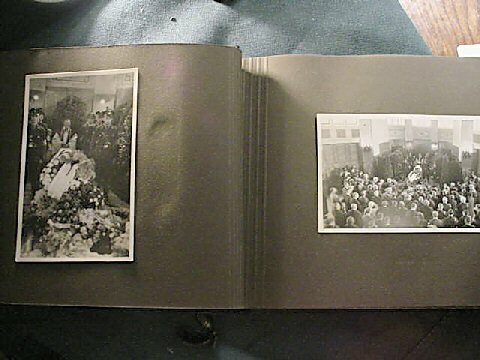 We believe these that were meant to be cased, but that would have been accomplished elsewhere. 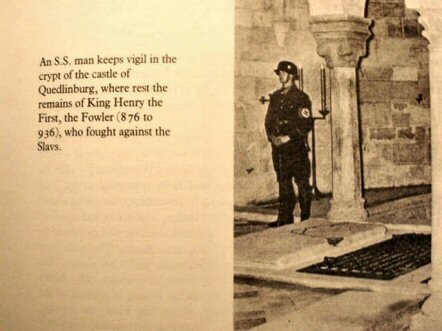 This is a very beautiful and extremely historically important piece from the SS ideology. DESCRIPTION: This is a 100 percent original piece, BUT, we will say at this point that the condition is not 100 percent. 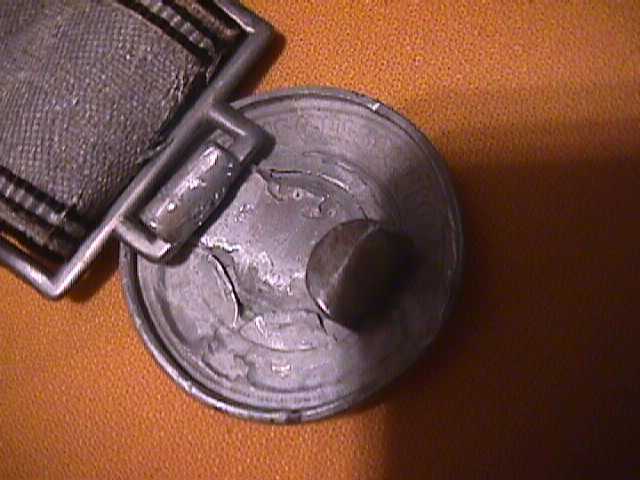 There will be "experts" out there who will dispute the originality of the buckle because it is unmarked. Other "experts" will pooh-pooh the fact that the rectangular openings are different sizes. 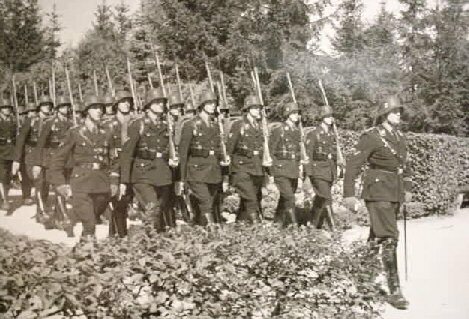 The problem with this field has perpetually been that many collectors do not take into account the ravages of war and time (especially time). 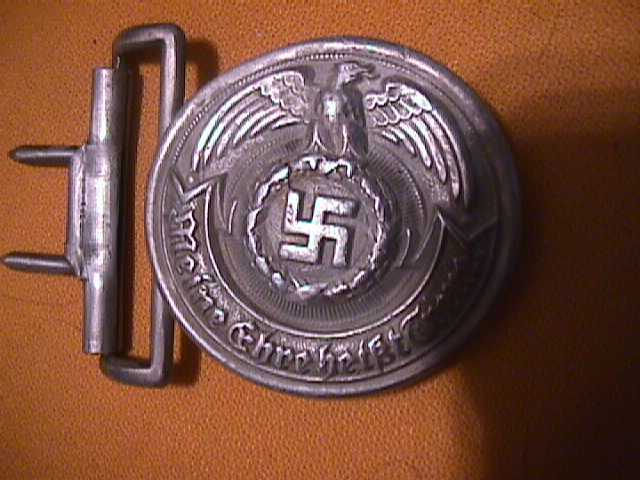 This belt was bought directly from a former member of the Allgemeine and, later, the Waffen SS, who reasonably explained that the leather attachment that held the prongs of the buckle came loose at one time when he was hurrying from pillar to post on the front and even though he could have had the later version "green backed," he preferred his old belt. 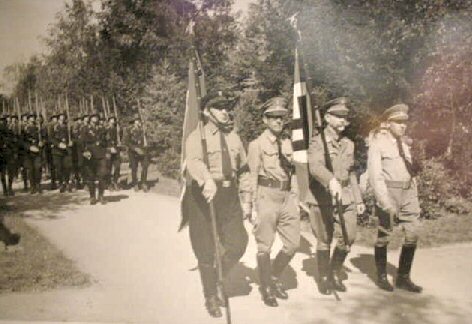 He was in the LAH and later transferred to the SS Politzei Division. 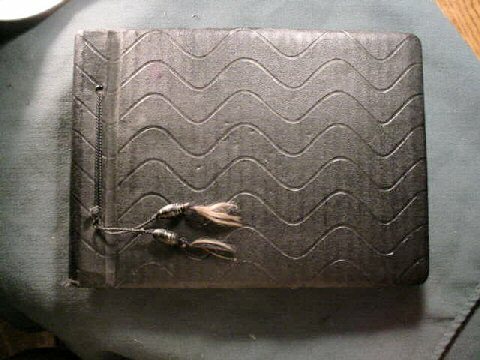 When the leather let go, the buckle was lost in the vehicle he was in while in France. 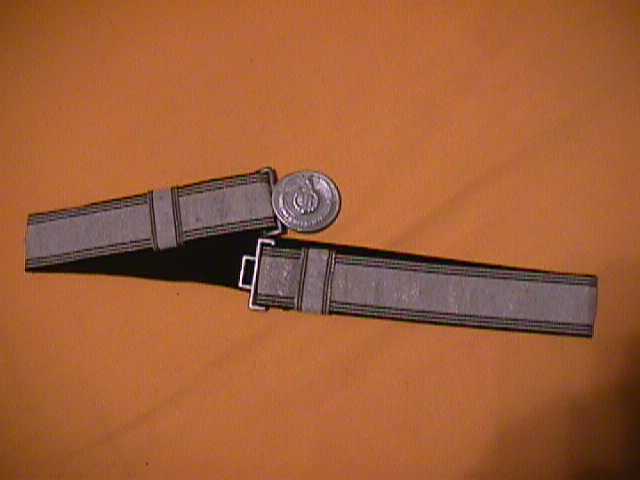 He wanted to wear this belt for ceremonies commemorating the victory over France and that was when he put out the word that he must have a buckle. He was a superior officer and he pretty much got what he ordered! 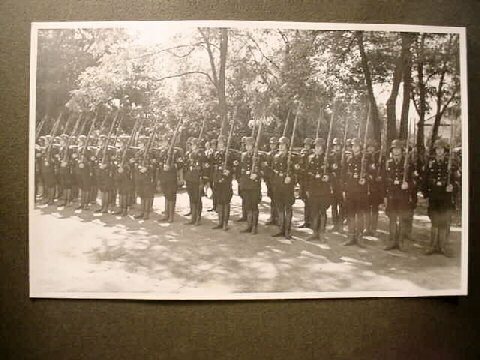 The buckle, such as it is, was brought up from the ranks and given to him. He never replaced it and here it is. That's the truth; that's the story. We think it is not only interesting, but we believe it even if this is not just as the "experts" would have it. 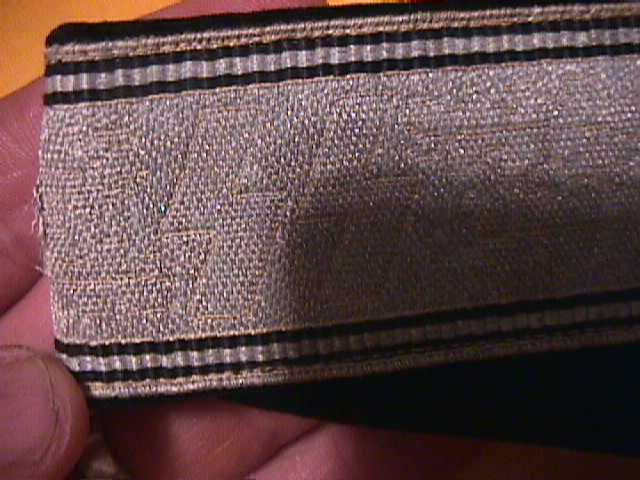 It is still a very rare and original belt and will make someone who can appreciate it, happy. Sold as is, but guaranteed original none the same. The price of one that is perfect is about $2,000 or more. 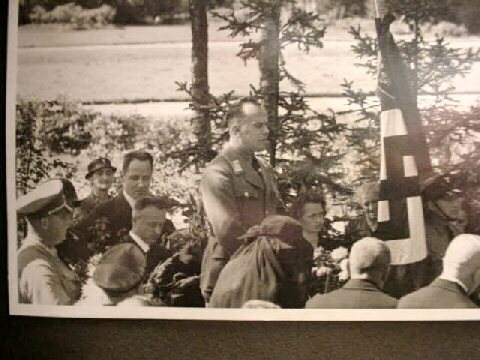 DESCRIPTION: The parents of the (translated) unforgettable Obersturmführer Sepp Scherbl in gratitude together with Sturmbann I, 3. 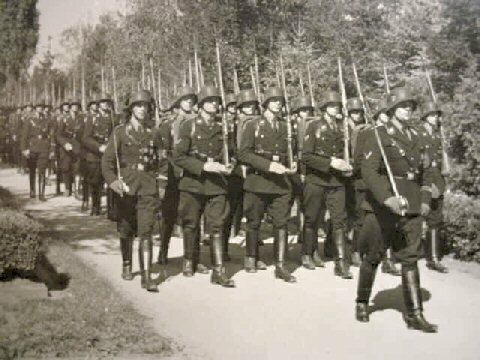 SS-Standarte, and Sturm 2. 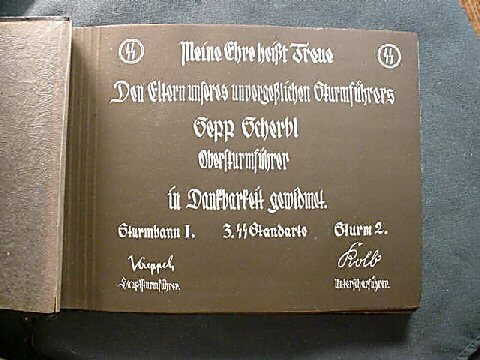 The first page is signed by the leaders of these groups. 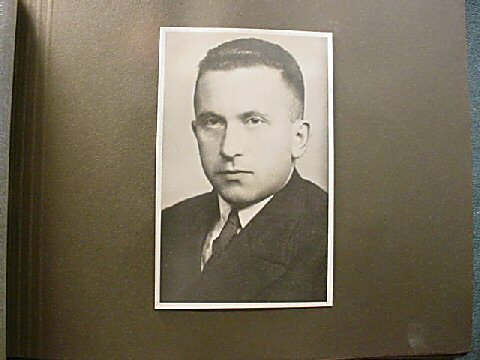 Nothing is known about this young man's death, but it is suspected that it may have had something to do with the communist terror in the German streets in that period. 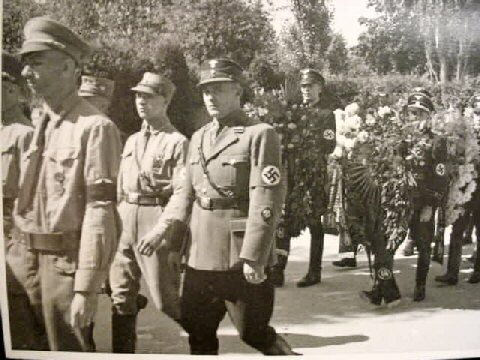 Also, the elaborate ceremony was attended by fellow SS-Kameraden, political leader corps, SA leaders, and the eulogy and depictions were by high-ranking SS leaders. 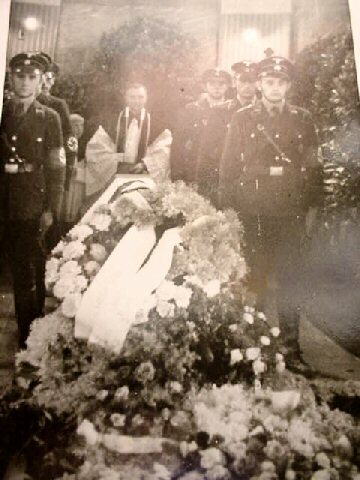 This was a little more than a normal SS funeral. 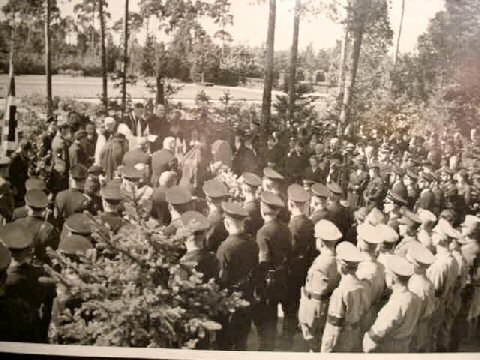 It is definitely a grandiose graveside scenario: somber, dignified, and please note the religious aspects with church and priest officiating. How can this be? 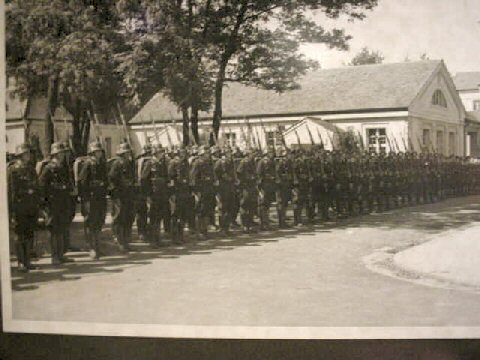 Weren't the SS all pagans and antireligious? Well that's what we are told isn't it? This is a very important historically archival item. 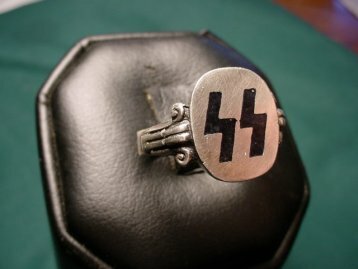 DESCRIPTION: This is one of the most interesting rings of the SS. 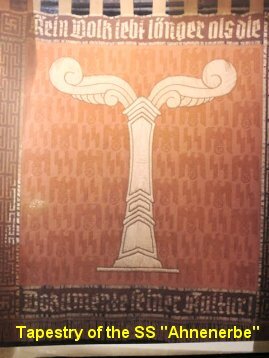 We believe it had something to do with the ancestral heritage study group Ahnenerbe. There are a couple of reasons for our speculation. Unlike some of the other rings that came in the huge collection bought in Stuttgart, there was no bench identification for these when found. 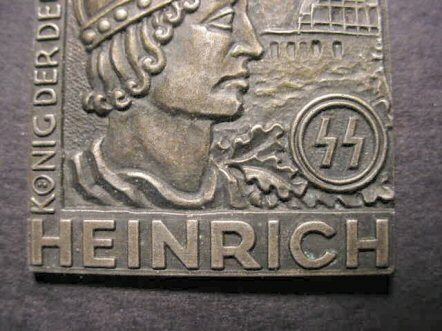 We do know that at least one of the jewelry manufacturers in Ludenscheid, where these were found, had the Ahnenerbe contract. The other ring, with the odd runic design, was easy to identify because there were labels and bin identification. Unfortunately, this one must go on a degree of speculation, but there is a strong case for the possibility and probability. The top of the ring has the shape of a runic planchet as used by the ancients in foretelling futures and was used in other Pagan ceremonies and rituals. We know that the Ahnenerbe did not have any particular uniform, but several pieces of jewelry to include rings, stickpins, and brooches, did exist. 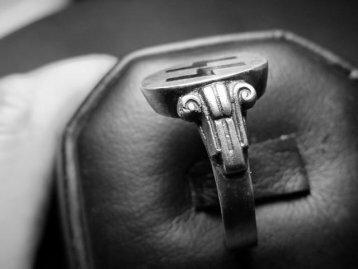 The most convincing aspect of this Ahnenerbe connection is evident in the design of the shank of this ring. 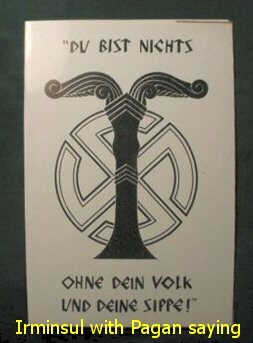 To each side of the runic top are motifs that appear to depict a symbol that was important to this SS organization, that was always cloaked in mystery. 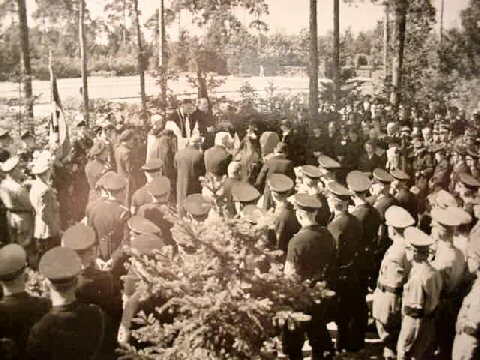 This was the Irminsul, tree of destiny, Wotan's monument. 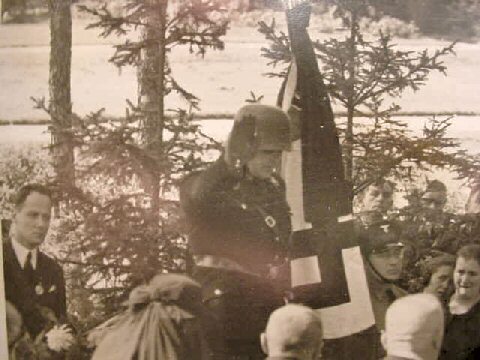 This immediately became an icon throughout the SS Reich! It was found in ironwork, wood carvings, paintings, and bronze sculptures. 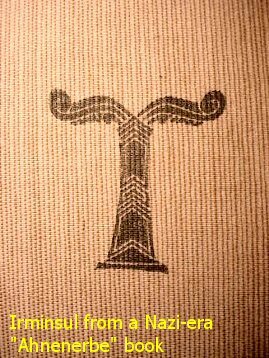 It was shown in many different forms, but always with a strong center trunk and always the flowing branches that sometimes dip and sometime curl, but ever Teutonic- or Celtic-looking in form. As a historian very interested in the Charlemagne and Wittikind saga and its Irminsul involvement, I honestly believe this beautiful ring is an Ahnenerbe-connected relic. Everything seems to point in that direction. I will be most happy to add an example to my own extensive collection of N.S. rings. With classic lines and aesthetic beauty, this is one of the finest and immeasurably important pieces of Germanic jewelry ever found. 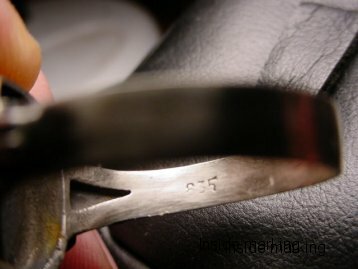 Marked inside the shank is "835" (silver content).